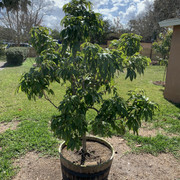 I live in Lakeland Florida, and I'm planning an experiment to get part of my Mauritius lychee tree to bloom. It's is currently flushing vegetation. I was planning on prunning the tall side of the tree back to previous hardened off flush but letting the rest of the tree left alone. I know the tree won't flower this year under the current circumstances. We are currently over 80* during the day and over 60* at night this week. That will end by Saturday and the forecast will switch to around 50-55 at night and 70-75 during the day with a few nights in the 40's. I'm also banking on the last half of January being cooler. Will doing this likely cause a bloom on the side of the tree I prune back 6-12 inches? Will the current heat mess this experiment up and thus I should wait a week after it turns cool to prune? The short side of the tree can grow and catch up. Thoughts? Pics below. You might consider cincturing or girdling, at least one branch. be fine if it is dormant. If it is flushing new growth it will burn the tree and you may not get fruit that year? days in the 40s. There is an 80% chance to have an EL Nino year and the last El Nino I got 10 1/2" of rain in January. If this happens the trees will flower and then if we get hit with a cold night, the fruit could be in jeopardy. It's always different every year in 9b but I keep hearing people trying to induce flowering of lychee/longans. Just like the mangos they need a couple months of dormancy especially if there is no chill? Pineislander: I have read that article and I want to stay away from doing cuts and such on my trees but it's also where I got the idea to prune the flushes. Pruning new flushes definitely helps to promote flowering. 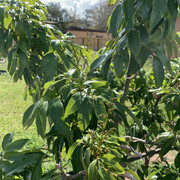 Prune the flushes as soon as they start forming. There was a research paper published here about this topic. Proven to work.Just work intensive on large trees. Achetadomestica: I don't water my trees or fertilize (never used fertilizer except micronutrients)anymore now that they are bigger. The entire areas is heavily mulched and we had extreme rain here this year. A couple of weeks ago we got around 6 inches in one day to top off a record breaking year. The tree was hardening off a flush in November which began September early October and near the end of November before the flush was completely hardened off and the cold hit the buds were already opening. Do to the cold we had in December the flush has been slow. This tree has a habit of near non stop growth, it's growing before previous flush completely hardens off. This will be the trees third winter. Even though this tree never seems to go dormant I'm wondering if the buds on previous flushes are considered dormant and thus pruning it back at the right time and cool temps will induce flowers in the section of the tree I prune. Fruit lovers: as you can see in my pics the flush is well under way. Would a person pinch off brand new flushes even if temps were warm? It probably would of worked had I pinched them back at end of November because most of December was cool here however I wanted to wait because I didn't want the flowers to flush out in early January when it's our highest danger of freeze. Thus I waited till now so when the new buds after pruning develop they will develop in cool temps but won't open up until after the highest chance of freezes is over. Yes you can cut the flushes even in warm temperatures, as long as it is still winter time. Remember, we never get cold temperatures in Hawaii, and cutting them off here still helped induce flowering. But the earlier you cut the flushes the better. already. Is winter over or just beginning? Well freeze events alter the scenario from trying to get bloom to trying to save the tree. I have things setup for freeze protection so I'm not to terribly worried in the event of a serious freeze. I'm going to prune on Sunday and we will see how long it takes to the next flush and what that flush is. As for winter I watch and study the forecast closely. So far I'm hearing cooler second half of January and cooler February but the first two weeks of January look good. Pinching off the late flushes has been used for lychee in China as well. I pruned the tree back to old flush three weeks ago and it has been cold ever since. We have had day time highs mostly bin 60's and lows overnight mostly in 40's. The buds are pushing already but so far they look identical to any vegetative flush I've seen. It may be to early to tell. I don't know how easy it should be to tell if the bud will end up being flowers at this early stage. I video recorded the prune and will do some more recording and combine them all into one video once the flush is absolutely clear as to what it is. I'm curious did you get the 5" of rain we enjoyed this past weekend? we are going to be 80/60s for 2 weeks? I bet you will see blooms if we indeed warm up. I hrought some tortoises in the house and put a heater on my 250lb aldabra. Then I checked at 12:30am and it was 42F. This morning it is 38F and still no frost. achetadomestica, we got about 3 inches of rain. We have had lots of rain this winter. Our pond level is still very close to overflowing the banks. We were 38* this morning with a few patches of frost on a bunch of leaves I recently put around my peach trees. The forecast is warming up but still looks good for lychee bloom. I think I should no something within two weeks. I just picked this lychee last year from a local nursery. Only got 1 flower and no fruit last year. Planned on planting it around now but is covered in flowers panicales so I will wait to see if it sets fruit. I fed it a heavy dose of morebloom a little more than a month ago and she’s covered in flowers now. My friend has several lychees and said I wouldn’t likely get flowers or fruit this year since it was still quite young. Not sure if the morenloom helped or not. I have been video recording the experiment which I think should be complete in March sometime. Interestingly the flush I did not prune eventually turned into bloom as it grew, probably because of three weeks constant cold and rarely getting over 70 degrees. The pruned portion is starting to flush now and it appears to me that it will be bloom. You may also want to check this out, if not for this year, maybe next year.